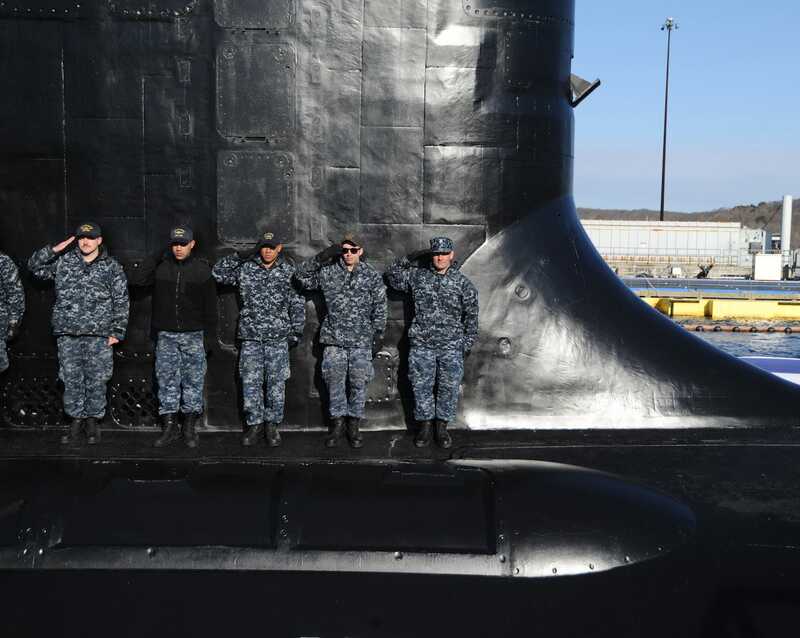 US Navy/Chief Petty Officer Darryl I. WoodSailors stand at attention on the USS Colorado after bringing the ship to life on March 17, 2018. 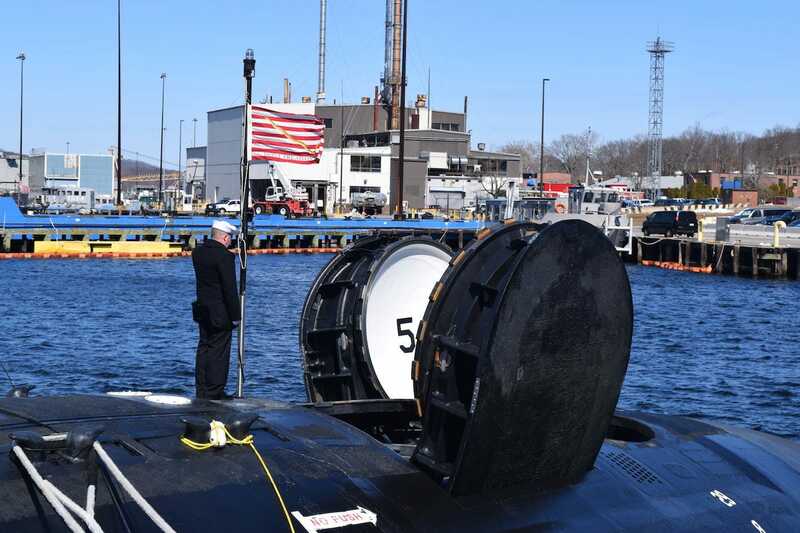 The latest addition to the US sub fleet was commissioned on Saturday and has an array of sophisticated technology that’s become the standard for US submarines. The USS Colorado also has a new feature: An Xbox gaming system controller used to guide its photonics masts, which replaced periscopes. 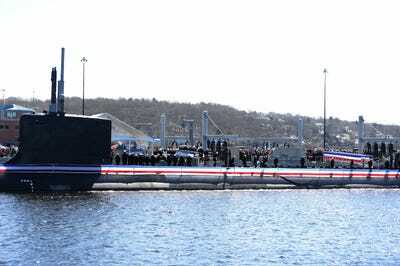 It is the 15th Virginia-class submarine, designed for deep-sea and near-shore environments. 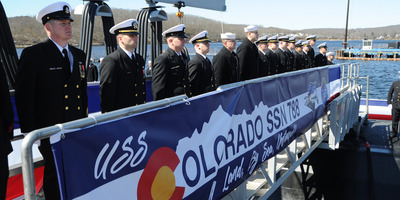 The Colorado will carry out the sub force’s seven core competencies: anti-submarine warfare, anti-surface warfare, delivery of Special Operations Forces, strike warfare, irregular warfare, mine warfare, and intelligence, surveillance, and reconnaissance. 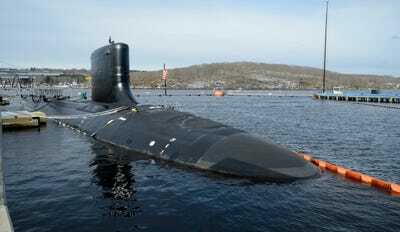 The $US2.7 billion sub was heralded as a “marvel of technology and innovation” by US Navy Secretary Richard V. Spencer. Construction started on the USS Colorado in 2012, and it is the fourth US Navy ship to bear the name. 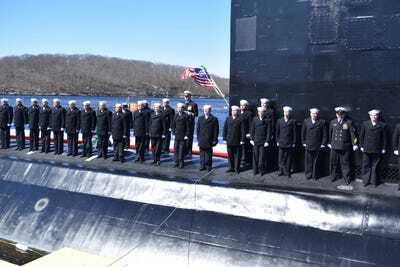 US Navy/Mass Communication Specialist 1st Class Steven HoskinsSailors assigned to the USS Colorado stand in formation after ‘Bring the Ship to Life’ during the commissioning ceremony at Naval Submarine Base New London, March 17, 2018. The first ship, which was actually named after the Colorado River, was a steam-screw frigate commissioned in 1858 and decommissioned in 1876. (Colorado didn’t become a state until 1876.) During the Civil War, it assisted the capture of Fort Fisher in Wilmington, North Carolina. The second was a Pennsylvania-class cruiser commissioned in 1903. It joined the Atlantic fleet in 1905 and later saw service in China, Japan, and the Hawaiian Islands. It was recommissioned as the USS Pueblo in 1916 so the name Colorado would be available for the Colorado-class battleship. It was decommissioned in 1927. The third USS Colorado was the first of the Colorado-class battleships, serving in the Navy from 1923 to 1947. It supported combat operations in the Pacific during World War II – including the brutal fight at Tarawa in 1943. It was present during Japan’s unconditional surrender in Tokyo Bay in 1945 and was decommissioned in January 1947. The newly commissioned vessel features the Rocky Mountain Grille – the ship’s galley – decked out with landscape photos by a Colorado photographer. 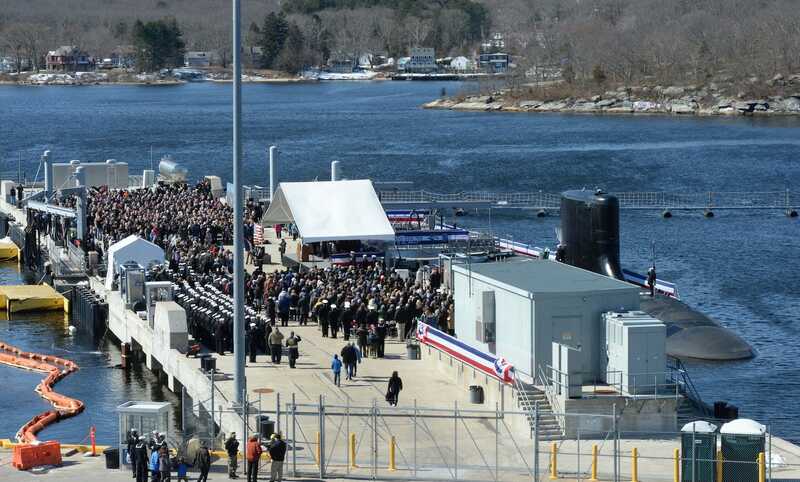 The latest USS Colorado, designed SSN 788, was built at Electric Boat in Groton, Connecticut. It displaces 7,800 tons and stretches 377 feet long with a beam of 34 feet. The Navy, in hopes of reducing lifecycle costs and boosting underway time, equipped it with a nuclear-reactor plant that doesn’t need refuelling during the ship’s planned lifespan. Submerged, the Colorado can travel at more than 25 knots. US Navy/Chief Petty Officer Darryl I. WoodSailors on the Colorado salute in front of the sail during a rehearsal for the ship’s commissioning, March 15, 2018. The Colorado is the the US Navy’s 15th Virginia-class attack submarine. US Navy/Mass Communication Specialist 3rd Class Tristan B. LotzThe crew of USS Colorado mans their newly commissioned submarine, March 17, 2018. The sub is part of the Virginia class’ Block III contract, for which the Navy redesigned about 20% of the ship to lower acquisition costs. Thousands of suppliers and shipyard workers contributed to its construction, which draws on modular features, open architecture, and commercial off-the-shelf parts — all of which is meant to facilitate future upgrades. US Navy/Mass Communication Specialist 3rd Class Tristan B. LotzThe Union Jack flies over the newly-commissioned USS Colorado, March 17, 2018. 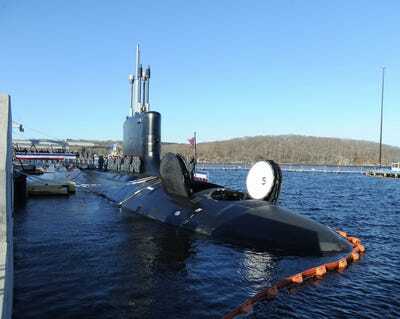 The Colorado also features a redesigned bow, replacing 12 Vertical Launch System tubes with two large-diameter, 87-inch Virginia Payload Tubes, each of which is capable of firing six Tomahawk cruise missiles. 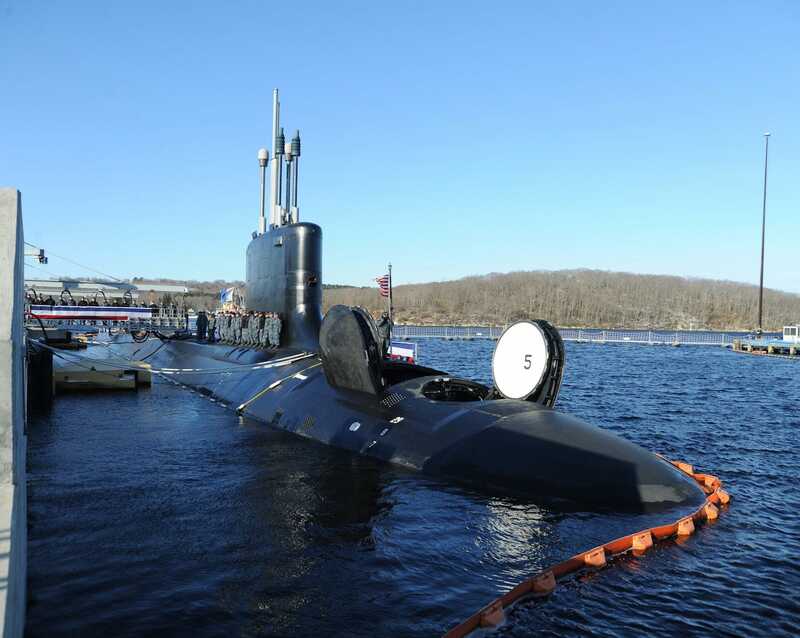 The new tubes simplify construction and cut down on acquisition costs, as well as offer more payload options, the Navy said. US Navy/Chief Petty Officer Darryl I. WoodThe USS Colorado sits pierside prior to commissioning, March 15, 2018. The Colorado is also designed to support Special Forces operations, outfitted with a reconfigurable torpedo room that can hold a large number of personnel and their gear for extended periods. 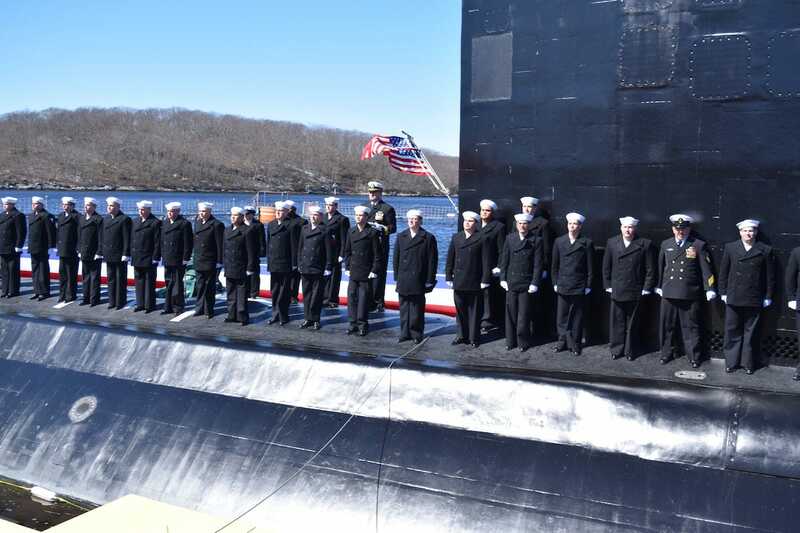 US Navy/Mass Communication Specialist 1st Class Steven HoskinsGuests at the commissioning ceremony of USS Colorado at Naval Submarine Base New London, March 17, 2018. 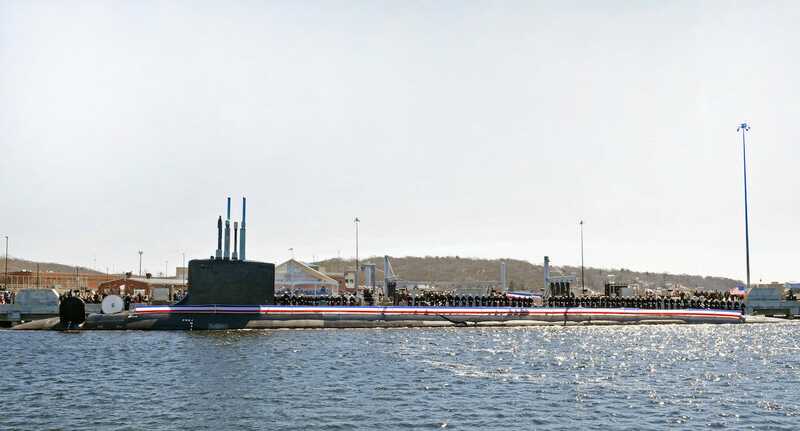 In Virginia-class attack subs, the usual periscope has been replaced by two photonics masts, which are mounted with telescoping arms carrying visible and infrared cameras. Unlike previous ships in the class, however, the joysticks used to manipulate the masts have been replaced by an Xbox controller. US Navy/Mass Communication Specialist 1st Class Jeffrey M. RichardsonLt. 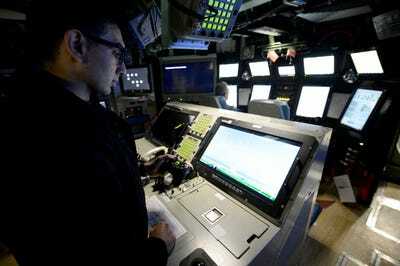 Anthony Matus uses an Xbox controller to manoeuvre the photonic mast aboard the Pre-Commissioning Unit Colorado, at Port Canaveral, Florida, January 12, 2018. The photonic masts can rotate 360 degrees, and their high-resolution cameras capture images that can be displayed on monitors everyone in the control room can see. The switch to an Xbox controller was prompted by concerns about ease of use and cost. Lockheed Martin said sailors who used the Xbox controller in their lab were able to figure out how to use it on their own within minutes. It’s also vastly cheaper – a controller, available off the shelf, costs less than $US30, compared to about $US38,000 for the photonic mast handgrip and imaging control panel. 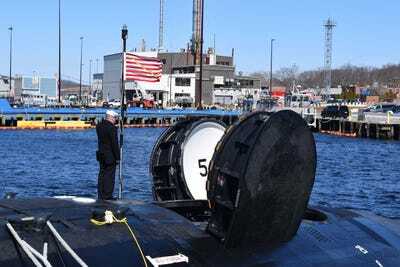 The Virginia-class Block III ships also include water-backed Large Aperture Bow array, replacing the usual air-backed sonar sphere, which the Navy says will boost passive-detection ability while cutting down on construction and maintenance costs. 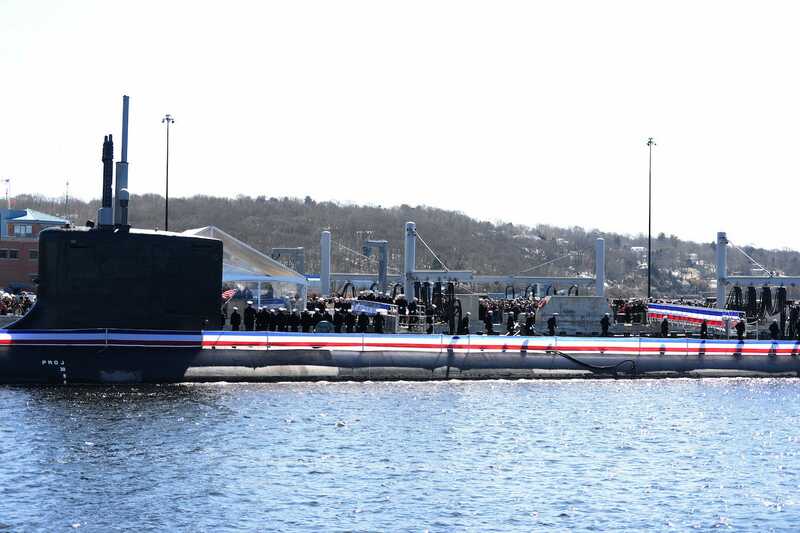 US Navy/Mass Communication Specialist 1st Class Jeffrey M. RichardsonThe USS Colorado sits pierside prior to commissioning, March 17, 2018. “Today’s world requires undersea platforms designed for dominance across a broad spectrum of regional and littoral missions, and I am confident Colorado will proudly serve in defence of our nation’s interests for decades to come,” Spencer, the Navy secretary, said. US Navy/Mass Communication Specialist 1st Class Steven HoskinsThe USS Colorado’s crew races across the ship’s bow and into formation after the ‘Bring the Ship to Life’ command is given during the sub’s commissioning ceremony, March 18, 2018.